It is rare indeed to see Živorad “Žika” Nikolić giving an on line interview even though he’s a hard working accordionist of the highest level living in London and enriching the London music scene with his eclectic mix of musical specialisations, after having settled from his native Serbia and having studied accordion at the Royal Academy of Music. 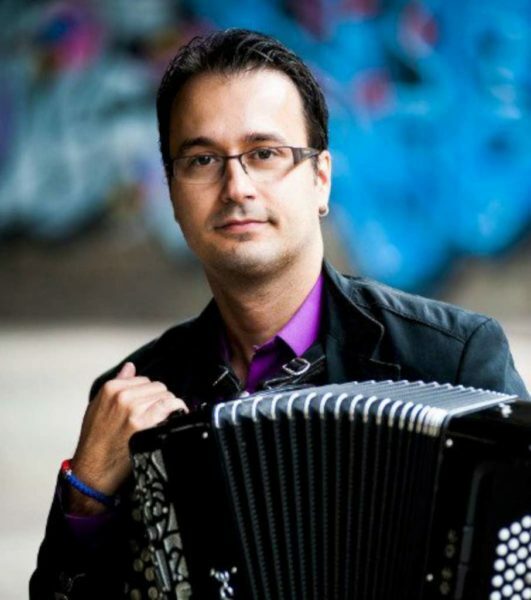 He teaches and also performs solo as a classical accordionist as well as in quite a few ensembles including Paprika alongside his friend and fellow accordionist Milos Milivojević (specialising in Balkan traditional music), the Fugata Quintet (who specialise in Piazzolla and Tango) and She’koyokh who play eastern European and Klezmer music. For accordion anoraks who enjoy such details Žika plays an instrument which has a B griff button system in the right-hand but a C griff button system in the left-hand free-bass. The story goes that when his parents were looking for a free bass accordion to buy from him, that was the accordion they found so he learned to play the two different systems with out giving it a second thought. The interview has some wonderful video musical excerpts where you can hear him at his very best playing and even singing with various ensembles. Enjoy. This entry was posted in News and tagged classical accordion, Fugata Quintet, Milos Milivojevic, paprika, Royal Academy of Music, She’koyokh, Živorad Nikolić.